SAN DIEGO (CNS) - All Metropolitan Transit System and North County Transit District services will be free Tuesday as part of the San Diego Association of Governments' support of National Rideshare Week. On Tuesday morning, MTS and SANDAG representatives welcomed public transit customers with rider appreciation events at two transit centers in San Diego County to celebrate the start of Free Ride Day. At the Old Town Transit Center, MTS CEO Paul Jablonski and SANDAG iCommute representative Antoinette Meier were there to give riders chances to enter a raffle featuring gift card prizes and a grand prize of one free adult regional transit pass valid for 12 months. At the E Street Transit Center in Chula Vista, SANDAG and MTS representatives also enterd passengers into the raffle. 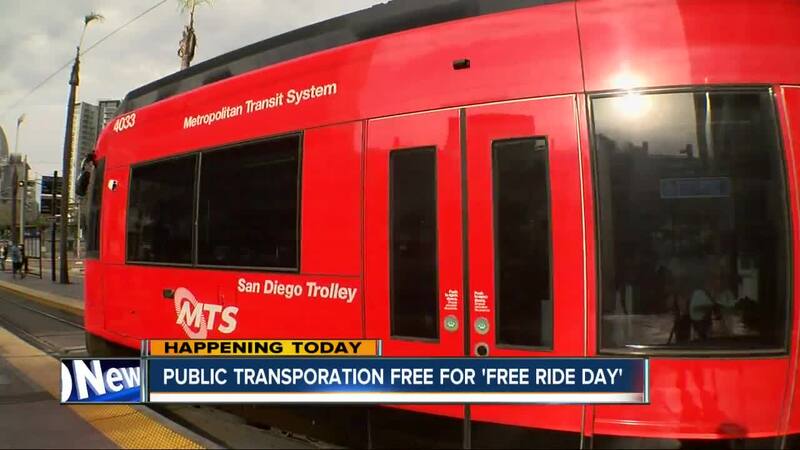 "We are hosting Free Ride Day to encourage San Diego residents to shake up their routine and choose transit," Jablonski said. "San Diego has a growing and thriving network of transportation options. Free Ride Day is designed to provide everyone an easy way to leave their cars at home and discover the advantages of taking transit." In September, SANDAG announced a partnership with ride-booking services Uber and Lyft to offer discounted fares for riders to travel to and from transit stops on Free Ride Day. SANDAG also has partnerships with Waze Carpool, which will offer free carpool rides throughout the week, and Bird, which will offer free helmets to customers at the Old Town Transit Center. "Our ask is very clear to the San Diego community. We want people to choose transit on Oct. 2," said MTS Board Chair and San Diego City Councilwoman Georgette Gomez. "Choosing transit is absolutely critical for this region as we all strive to meet our climate action goals. We need to do everything we can to change commuting habits and get people to try alternative modes of transportation. Free Ride Day is designed to do just that."